This article is about the person. For locations in the game, see Places. 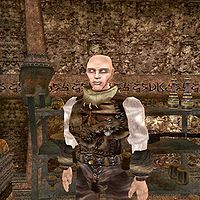 Areas is a Nord barbarian and a vampire in the Quarra Clan. To anyone not of the Quarra blood, he is hostile, and will attack on sight. To his fellow blood members, he offers a selection of goods for sale, provided you have dealt with the Cult of Lord Irarak. He wears a common shirt, pants, and pair of shoes, a netch leather cuirass, Nordic fur bracers, and he carries a random blunt weapon for self-defense. He also knows the absorb health (ranged) spell. This page was last modified on 28 January 2019, at 00:29.